There’s a growing trend of businesses taking on social responsibility measures, but not always for the right reasons. Some organizations use social consciousness and sustainable methodologies as a marketing tool or to check a box for the annual report, but many more are authentically concerned with using their business to help people and the environment. Companies that are truly committed to social responsibility establish and follow an ethical framework as a course of their business, promoting actions that benefit the local environment and society as a whole. One of the best ways to demonstrate your company’s dedication to these ethics is to take the steps required to achieve B Corp certification. Many companies, including Ben & Jerry’s, Patagonia, Seventh Generation, Etsy, and Warby Parker, embrace the B Corp label as a representation of their commitment to social responsibility. As of 2017, the number of certified B Corps had grown to more than 2,300, and that number is likely to continue on its impressive growth trajectory. The certification process ensures the legitimacy of the data and the intention of the company’s leadership. The use of audits, biennial re-certification, and the thoroughness of the application process virtually ensures that every B Corp is an authentic representation of this commitment. B Corps are 28% more likely to hire minorities and women for management positions, 55% more likely to cover some of the cost of health insurance for workers, and 45% more likely to provide bonuses to nonexecutive workers. Moreover, companies that take on the B Corp certification challenge are four times more likely to pay for professional development opportunities for their employees and more likely to give employees paid volunteer days in the community. 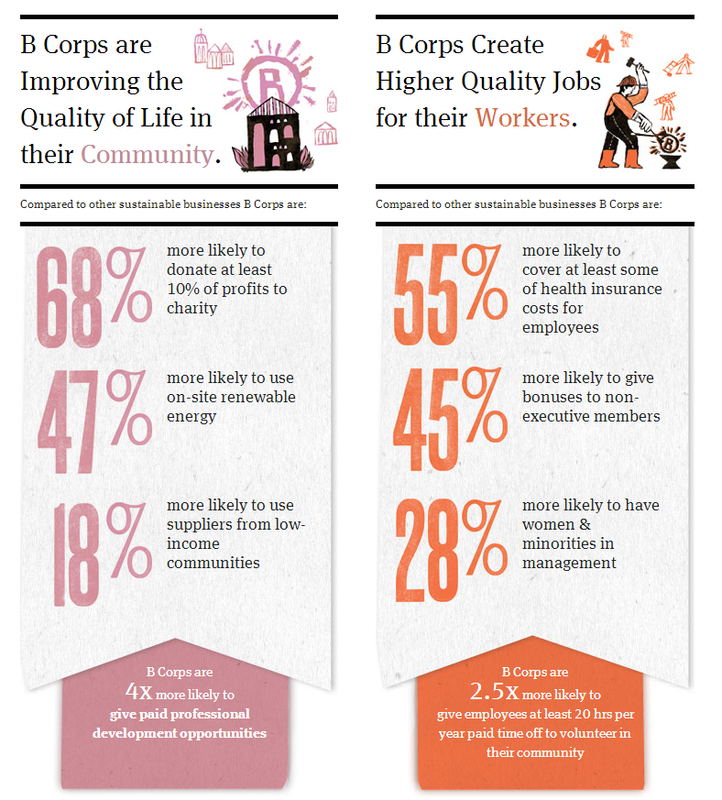 These stats help illustrate how B Corps help to establish higher-quality jobs while also improving lives in their local communities. And while these examples clearly show how B Corps benefit themselves and others by providing value for their employees and communities, some organizations contribute on a much larger scale. At Patagonia, for example, their love of wild and endangered places compels them to significant preservation and restoration work. In addition to being the gold standard of supply chain management (i.e., verifying every detail of what goes into its products), this B Corp donates time, services, and at least 1% of its sales to hundreds of grassroots organizations all over the world that work to help reverse the tide of environmental degradation. Patagonia’s collective efforts have contributed more than $185 million to conservation efforts, and it has invested $38 million in companies and ventures with socially responsible models. It is an excellent example of a company executing on its social mission. Even if you’re not quite ready for the strenuous B Corp certification process, there are other ways to move toward that goal. Here are four things you can do to put your organization on a path to sustainability and social responsibility.